ONE of the plans of Vice Governor Bong Lacson, when he is governor of Negros Occidental, is to push for tourism programs. I know that he has the will and the capabilities to do it. I saw his actions and determination when he was a mayor of San Carlos City. The late Oskee Coronelio, former tourism officer of San Carlos, was my best friend. After judging Pinta Flores street dance competition, we would have dinner at the hacienda house of Mayor Bong. After dinner, the mayor would gather all the judges to thank them. That was also an opportunity to tell us of his current and future plans. When he became Vice Governor, he is closer to us. He would always tell the tourism officers to work hard for Negros and be the best salesmen for Negros. His plan to work with outgoing Third District Representative Alfredo Benitez to strengthen the economic team in the province is a master’s stroke. Cong. 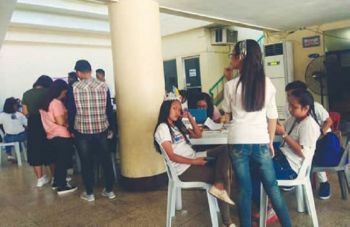 Albee made the Third District a pilot political district where mayors and barangay captains put forward their right foot to establish political-social-economic stability. The name “Cong. Albee” is synonymous to prosperity, peace, and unity. I know that well because among the so many things he did was the realization of the airport road leading Silay, to Bacolod, and Talisay... and soon to E.B. Magalona and Victorias. The Patag-Lantawan ecotourism highway was once a dream but during his time it becomes a reality. That could be a formula for tourism. I am sure that the future Cong. Kiko Benitez will continue the tourism chivalry of Cong. Albee. He personally told me that. Future Governor Bong Lacson will give his best performance for Negros. I am sure of that. Negros now is in better shape with my friend, Cristine Mansinares, the provincial tourism officer. A push in tourism program will reach a longer distance. The province with cities and municipalities can start receiving comprehensive tourism development plans. We can still develop more areas as tourist potentials. Conservation of landmark and heritage structures could be given emphasis. People working in the host communities should be consulted in selecting options for tourism project development. Pollution controls should be considered in building infrastructures to be considered as part of our green building tourism. Good management should be institutionalized for the heritage sites. There should be tourism cultural codes for towns and cities even in the barangays. The Lacson tourism program will provide socio-economic upgrading for the underprivileged persons who seek work opportunities. I am sure that this could be done. What we need here is an expert who can connect to the national government, non-government historical societies, groups of conservationists, cause-oriented humanitarian groups, private sectors specializing in heritage work, or the Negros hacenderos where the heritage sites have been part of their property. Governor Lacson and friends will simply make Negrosanons aware of their cultural patrimony and collective history.